1. Yoan Moncada was the only White Sox player to score in the first game of Tuesday’s doubleheader against the Twins. He led off the game with his eighth home run of the season which was an absolute bomb to centerfield. Moncada then scored another run in the fifth inning when he was driven home by a Jose Abreu double. Abreu is currently second in the majors with 22 doubles. 2. Moncada’s two runs were enough support for Reynaldo Lopez, who needed 106 pitches to get through seven scoreless innings. Lopez’s start was once again something of an enigma as he struck out only four batters while also walking four Twins. Lopez got 11 swinging strikes on the day (10.4 percent), which is just below the league average (10.6 percent) in that department. Lopez didn’t give up any runs in large part because very few Twins were able to put good swings on the baseball. Yes, you’d absolutely like to see more strikeouts and fewer walks, but we need to get enjoyment from this season where we can and it is really fun to watch a young starting pitcher throw up goose eggs on the scoreboard against a division rival, and there are certainly other factors at work which are working against Lopez in each of his starts, but more on that later. 3. The two runs, however, were not enough support for the White Sox bullpen. Nate Jones came into the game in the eighth inning and retired the first two batters he saw. Jones then proceeded to allow a “hit” (a generous scoring decision) to Brian Dozier, a walk to Eddie Rosario, a laser single to Miguel Sano which scored the first Twins run, and finally the decisive blow, a three run home run to old friend Eduardo Escobar. Dozier’s single was a sharply-hit grounder that bounced off of Yolmer Sanchez’s glove. Sanchez then recovered the ball with a nifty barehanded grab, but was unable to get the ball over to first on a fly and Abreu could not pick it out of the dirt, which opened the floodgates for the Twins. Based on the very solid defense we typically see from Sanchez, I’m sure he’ll tell you he should have made that play. Alas, it was not meant to be. 4. In the top of the sixth inning, the White Sox broadcast showed a highlight of Giancarlo Stanton hitting a monstrous home run off of Mike Fiers. The home run itself is nothing new for Stanton, but what was remarkable about it was that it came after Fiers had drilled Stanton with a pitch earlier in the game. This led to an enjoyable dialogue between Jason Benetti and Steve Stone in which Stone revealed that he was not a fan of Major League Baseball teams getting into beanball wars. I couldn’t agree more with Stone on this, and certainly do hope that MLB teams can move away from this frontier-style of justice. It’s really dangerous for the players and no one wants to see their players get hurt. 5. Calling back to No. 2, Lopez got very little help on the day from Omar Narvaez behind the plate. Narvaez has been worth a staggering -9.8 FRAA on the season and White Sox catchers have been worth nearly -15 FRAA as a unit, worst in the majors by a significant margin. Tuesday was no exception. On several occasions, Lopez threw borderline pitches that could very easily have been called strike threes, but instead were called balls because of poor catcher positioning/framing. Catcher framing has been a huge concern for the White Sox for a number of years now, and I certainly hope that they can find a catcher in the near future that can accentuate their young starters instead of actively harming them on a pitch-by-pitch basis. 6. After a short recess, the White Sox and Twins were back at it again for game two of their doubleheader. The Sox jumped all over Twins starter Zack Littell, who was making his Major League debut, and put up a big crooked number on the scoreboard with four runs in the first inning. Abreu kept up his hot hitting with a two-run blast. Tim Anderson got his first hit of the day with a double, Kevan Smith (welcome back!) drove in Anderson with a single and Adam Engel kept the party pumping with a line shot over left-fielder Eddie Rosario’s head to score smith. Lucas Giolito followed up the big first inning by getting the Twins to go 1-2-3 in the bottom of the first. Why can’t the entire game be made out of the first inning? 7. Speaking of Engel, he’s really been hitting the ball well as of late. Since his OPS hit its season low of .396(!) on April 25, Engel has put together 111 plate appearances with a triple slash line of .275/.321/.422. His OPS on the season is now up to .621. Engel’s speed defense has always been his calling card with the big league club and his bat an afterthought, but it’s nice to see him start to come around with the bat and make the most of his extended opportunity on the big league club. When the White Sox are competitive again, they’ll need players like the more recent version of Engel to provide positive value off of the bench and guard against season-sinking injury replacements like the J.B. Shuck experiment. 8. As with most Giolito starts this season, I was skeptical that four runs would be enough for the White Sox to have the lead after Giolito departed. I ended up being wrong, but Giolito was not as sharp as his two runs allowed over six innings would indicate. He got some batted ball luck to get out of trouble in the second inning after he allowed the first two batters to reach, and then he benefitted greatly from a Twins base running blunder in the third. Eddie Rosario sent a towering fly ball to right field with no outs and runners on first and second base. Neither of the runners nor White Sox right fielder, Trayce Thompson, seemed to be able to pick up the baseball which ended up hitting the top of the right field wall. The runners were only able to advance one base and Sano bounced Giolito’s next pitch to short for an incredibly well timed double play. The Twins would get one run on the double play and Escobar would drive in the remaining runner on base with a double to the left-center gap. Giolito may have only walked two Twins on the evening, but his control was largely erratic, as he threw only 56 of 95 pitches for strikes. While it’s good to see Giolito make it through six innings allowing only two runs, it was mostly lipstick on a pig. At some point he needs to limit the amount of solid contact he is giving up and start striking out more batters than he walks (he only got one strike out over the six innings) if he’s going to see his ERA fall significantly from its 7.08 mark. 10. Sanchez continues to have a very solid season at the plate. He added another double in the top of the fourth inning that drove in two more runs and chased Littell from the game. Sanchez doesn’t get the hype that Moncada or Anderson do, but he may very well be a great fit for the next White Sox contender and watching him on a nightly basis continues to be very enjoyable. Sanchez’s double in the fourth was actually the last run scoring plate appearance of the game for the White Sox as their bats would fall silent against the Twins bullpen. 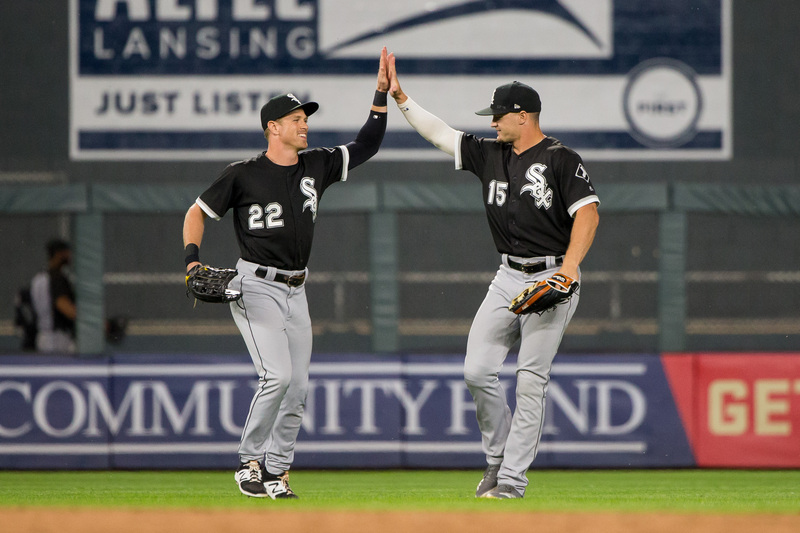 Luckily enough for everyone invested in White Sox baseball, six runs would be enough as the White Sox took the nightcap in the doubleheader, 6-3. Chris Volstad was able to throw a scoreless seventh, and four relievers, Jace Fry, Bruce Rondon, Luis Avilan, and Joakim Soria, combined to allow only one run in the bottom of the eighth inning. Soria would stay on for the ninth, where the Twins would get runners on the corners with two outs, but he retired the final batter to preserve the win. With the split, the White Sox start an amazing 21-games-in-20-nights streak of baseball on a relatively positive note. Next up is another match-up with the Twins. The probable starters are Jake Odorizzi and Hector Santiago. 11. As a bonus item, it was nice to see both the Twins and the White Sox wear their Jackie Robinson uniforms in the opener of the doubleheader. The first game, of course, was a make-up game from the last time the White Sox traveled to Minnesota and were treated to some extended time off because of the early April snow. The two teams would have worn their Robinson jerseys on the original scheduled date, so I’m glad they decided to sport them again today to honor one of the most important players in MLB history. The framing is why Smith was called up. They are willing to let teams run roughshod on him because he gets a few more strikes out of the pitchers which right now is what they desperately need much more than controlling the running game. Especially Giolito and possibly Fulmer.